In the market for fishing tackle? You can spend thousands of dollars OR have unbiased knowledge from this website and go prepared knowing exactly what you are looking for when shopping. Sometimes the simplest and cheapest fishing tackle works the best. I learned that from trial and error. You could literally spend thousands of dollars on fishing gear and what would work is a $2.00 lure and a wax worm. Go figure. Does lure color matter underwater? At the end of the page you will find a helpful diagram showing lure colors and light absorption. Black is shown as the best color to use in deep water. See for yourself. 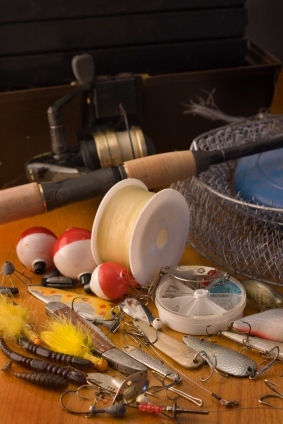 I could go on and on about fishing tackle, but will first stick to the basic equipment that you should own to increase those odds to easily catch your daily limit of fish. Skill is very important but I will go into that later. Fishing is America's favorite pastime and still is today. We never had the variety and choices in fishing equipment when I was young. Look at it today! It is steadily growing in leaps and bounds year after year. I believe American families are now "getting back to basics" and doing things in life that they used to as a child. Of course the obvious is a fishing rod and a reel, but you must have more than that (if you are just starting out) to catch some fish. Click on the above link for our opinions and recommendations on fishing rods. Which fish are you targeting? The type of bait and lures you will use depends on the specific species you are after and the area (lake or river) that you will go. We go on to recommend various rods and reels for fishing tackle, but I want to let you know one thing first. The BEST ROD AND REEL for fishing is one that works for YOU. YOU catch fish on it and in addition to having fun filling the daily limit fishing, you are also enjoying the great outdoors. That's the best; to us. Do you prefer live bait? Or lures? Both work great, but at times the fish do not bite on the lures and go crazy on the live bait. Or vice-versus. Sometimes they want a dead worm or minnow versus one that is alive. Finicky at times, fish are delicious and well worth the effort to find what they want, and are biting on so you can catch them. Do you want to learn the basics needed in a tackle box? You'll find great information at that link. You may think that fishing reels are pretty much the same and it comes down to what you have on the end of the line. We don't deny that part of this is true, but owning the right fishing reel makes all the difference. When fresh water fishing you have several different types of fishing reels that you can purchase. I explain the different reels at that link. Fishing can be a very calming and relaxing past time. "A bad day of fishing is better than a good day at work" seems to ring true around here. Anglers obviously are so happy outdoors and in nature that dropping the line in the water and coming home empty-handed, doesn't break the spirit and they still come home happy. Having the right fishing tackle and gear does make a big difference.